A Bollywood sports biopic that gets nearly all its moves absolutely right, Dangal draws its strength from a blindingly luminous lead performance from a shape-shifting Aamir Khan. But over and above his physical transformation, compete with wobbly gait and scraggly stubble, so impressively measured is the actor in the guise of national wrestling champion-turned-coach Mahavir Singh Phogat that he completely erases the boundary that separates the star from the role. Rarely has a Bollywood actor sunk his teeth into a meaty character with such gumption and glory. Dangal is the story of a Haryana man who dared to do the unthinkable. It is just as much the tale of a pugnacious girl who went where nobody from her tradition-bound village had ever gone. But above all, Dangal is a hugely entertaining sporting saga that works simply as a piece of good old storytelling leavened with rousing, crowd-pleasing ingredients. Cinematic sagas of real-life sporting icons have to inevitably contend with one obvious drawback: the stories they tell are well-documented and, therefore, devoid of any mystery. The element of collective familiarity, especially when the film is about a popular discipline, is more often than not aggravated by Bollywood's tendency to go for broke in terms of melodramatic flourish. Dangal gives no cause for worry on that score. Until one rather gratuitous 'Bharat mata ki jai' moment in the climax, restraint is the film's strongest suit. Although the film does harp on 'desh ke liye medal', it refrains from demonstrative chest-thumping and flag-waving until the ill-advised BKMJ slogan that rents the air at the end of the national anthem played at a medal presentation ceremony. The screenplay weaves tempered doses of fiction into the film's essentially realistic tapestry (which is accentuated by the way director of photography Setu lenses the village scenes). The result is a film that springs many a delightful surprise. Dangal blends humour with intensity, and intimacy with spectacle, to perfection. On every parameter, Dangal matches, if not surpasses, Chak De! India and Iqbal, the two Mumbai films that did justice to the sport that they took up for dramatization. Dangal is, however, more than just a film about a popular contact sport. It is also more than just an Aamir Khan film. Dangal smells of the soil of a village and the mud of a wrestling pit as it does of the blood and sweat that goes into the making of champions. Mahavir, forced by circumstances to call time prematurely on his thriving wrestling career, trains two of his daughters with the aim of fulfilling his thwarted dream of winning an international medal for India. The heroism that it celebrates is not of the infallible kind. Both Mahavir and his first-born Geeta are given to acts that place them at odds with each other and with the national wrestling establishment. The battles that duo fights are on two levels - personal and social. While the girl must learn to control her mind and channel her aggression on the mat, the old man is required to subdue his tendency to bite off too much in the single-minded pursuit of his goal. Among the high points of this well-crafted film are the nail-biting wrestling sequences. They are so believable and convincing that there are times that, despite the obtrusive, over-simplified commentary on the soundtrack, they come across as the real deal. All credit to Fatima Sana Shaikh for fleshing out the character of Geeta Kumari Phogat, Mahavir's eldest daughter, without any false steps and miscues, and for pulling off the 'action' scenes with such aplomb. She serves the film's cause very well because it is Geeta who emerges as the focal point of Dangal as it hurtles towards its climax. The young wrestler takes on grapplers more fancied than her in the 2010 Commonwealth Games in Delhi on her way to the gold medal in the 55 kg category. In the film's overall scheme, Babita Kumari (Sanya Malhotra), who won the silver at the same event, takes a backseat, serving merely as an involved cheerleader in the climactic scenes. Director and co-screenwriter Nitesh Tiwari does not shy away from resorting to touches of sentimentality, but he keeps a tight rein on the flow of emotions as a tenacious father and his daughters navigate a treacherous social terrain steeped in deep-rooted patriarchy, gender prejudice and rural orthodoxy. What the audience sees in the film is that the visible weight around the male protagonist's paunchy waist is nothing compared to the massive burden of ambition and obsession that he carries in an ultra-conservative rural society. But what Dangal does best is in not falling for the temptation to give Mahavir Phogat a halo. He isn't by any means perfect. Driven by a personal agenda, he is guilty of robbing his daughters of their childhood and pushing them into the wrestling pit before they are old enough to decide for themselves. The protests of the two girls and his wife Daya (Sakshi Tanwar, subdued but effective) fall on deaf ears. He also takes no note of the sneers and sniggers that he faces for letting his daughters wrestle with boys in order to hone their skills and shore up their confidence. Mahavir's obstinacy stems from his unwavering determination to turn his girls into the boys that he doesn't have. The daughters Geeta and Babita want to opt out, but they aren't allowed their own agency. But as time elapses and Geeta and Babita see in their father's medal fixation an opportunity to escape the plight of the other girls in their sleepy Haryana hamlet - Balali, Bhiwani district - who are pushed into dead-end domesticity as soon as they step into their teens. The main conflict point in the film - rooted father who believes in traditional coaching methods versus daughter who flies the coop to be exposed to the more modern ways of the national sports academy - are delineated with remarkable poise and efficacy. The least convincing part of Dangal is the character of the myopic, manipulative national coach who sees in Mahavir Phogat an impediment to his plans for Geeta Phogat. But thanks to the way the gifted Girish Kulkarni plays the role, the man does not stick out too much. 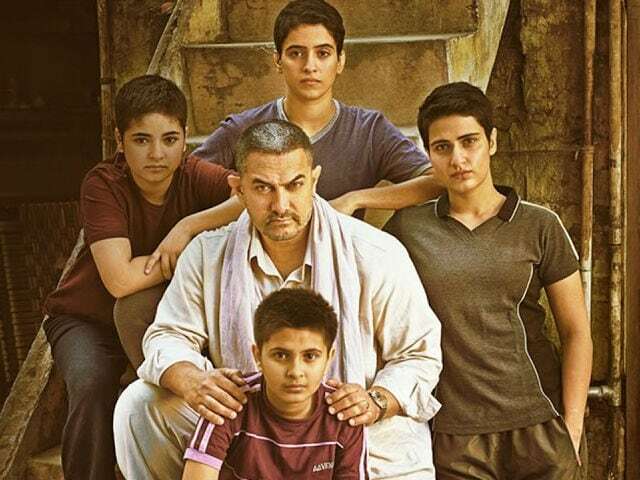 Dangal is the kind of sports film that usually eludes Bollywood. It knows the rules inside and out and meticulously plays by them without ever succumbing to dreary predictability. Dangal is an outright winner - a film that will pin you down and keep you in its grip all the way through.